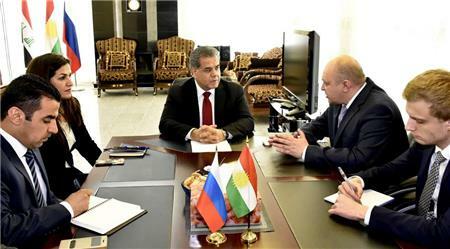 Minister Falah Mustafa met yesterday at the Russian Consulate General in Erbil with Consul General Viktor Simakov to thank him for Russia’s support and to exchange views on issue of common interest. Consul General Simakov reaffirmed Russia’s commitment to Kurdistan Region and Iraq to confront together the scourge of terrorism in the region. Recalling the historical and cultural bonds that connect Kurdistan and Russia, both sides agreed to continue working together in order to further strengthen and broaden bilateral relationships. Erbil, Kurdistan Region, Iraq (presidency.krd) - Kurdistan Region President Masoud Barzani yesterday received UN Secretary-General Ban Ki-moon, World Bank President Dr. Jim Yonk Kim, Islamic Development Bank President Ahmad Al-Madani, and Special Representative of the UN Secretary-General in Iraq Ján Kubiš, accompanied by senior officials of the United Nations, World Bank, and Islamic Development Bank. President Barzani described the visit as important and a source of hope and support for the people of Iraqi Kurdistan. He explained the challenges the Kurdistan Region currently faces, most notably a fierce war against terrorism and a severe financial crisis, as well as accommodating an extraordinary number of internally displaced persons, IDPs, and refugees. President Barzani stated that Kurdistan Region has not received any financial support to ease the impact of the crisis, and the Iraqi Government has not fulfilled its promises to help support displaced persons. President Barzani highlighted the reform programme recently undertaken by the Kurdistan Regional Government, stressing that the government is committed to taking all required steps necessary towards its full implementation. President Barzani stated that in its assistance to Iraq and the Kurdistan Region, the international community must take into account that the Kurdistan Region faces a formidable frontline responsibility in the war against ISIS and in supporting a huge number of IDPs and refugees. The UN Secretary-General explained that he came to confirm the support and sympathy for the people of Iraqi Kurdistan, praising the leadership of President Barzani in the fight against ISIS and the bravery of the Peshmerga. He noted that in spite of a severe financial crisis the Peshmerga forces are in the forefront defending the world against terrorism. 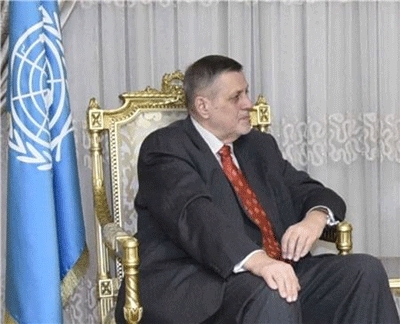 The UN Secretary-General also thanked the people and the Kurdistan Regional Government for hosting hundreds of thousands of displaced people who fled ISIS terrorism and took refuge in Iraqi Kurdistan. The World Bank president briefed President Barzani about the assistance the World Bank can offer to Iraqi Kurdistan. He expressed satisfaction with the reform programme adopted by the KRG and stressed that it should be supported. The Islamic Development Bank president noted that the bank is keen to support Iraqi Kurdistan in its reform programme, help displaced people and work to assist them in returning to their liberated areas. At the end of the meeting, President Barzani described the UN Secretary-General as a close friend of the people of Iraqi Kurdistan and thanked the UN teams for their work in Kurdistan Region. The meeting was also attended by senior Kurdistan Regional Government officials including the Prime Minister, Deputy Prime Minister, Chancellor of the Kurdistan Region Security Council, Interior Minister, Acting Minister of Peshmerga Affairs, Chief of Staff of the Kurdistan Region Presidency, Minister of Planning, KRG Spokesperson, and Head of the Department of Foreign Relations. 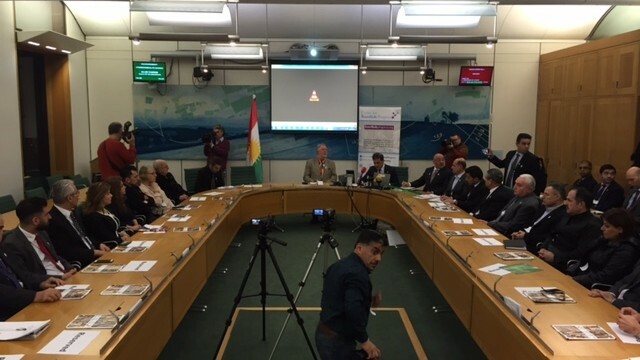 On 16 March 2016 the KRG UK Representation in collaboration with the All-Party Parliamentary Group on the Kurdistan Region and The Centre for Kurdish Progress hosted a Rally for Halabja Remembrance in the British Parliament. Marking the 28th year commemoration of the Chemical bombardment of Halabja, one of the most horrific crimes committed against humanity in the twentieth century resulting in the death of more than 5,000 innocent people including men, women and children and leaving 10,000 people with server lifelong injures at the hands of the brutal regime of Saddam Hussein simply for being a Kurd, was attended by British Ministers, Members of Parliament, House of Lords, members of the diplomatic community, the former KRG Minister for Martyrs and Anfal Affairs, civil-society, the business community, Kurdish and Iraqi political parties, the Kurdish Diaspora, and representatives from the UK and Kurdistani media organisations. Hilary Benn, the Shadow Foreign Secretary, from the Labour Party, expressed his gratitude and tribute to the Peshmerga and the KRG for their alliance with the UK and the global coalition to defeat Daesh. He concluded his solidarity message with the people of Halabja and Kurdistan by saying “As we mourn the loss of so many lives in the horror of Halabja let us resolve to giver expression to the words “never again”. At the end of the event guests had the opportunity to write a message expressing their solidarity with the people of Halabja in the book of commemoration that will be presented to the Governorate of Halabja by the KRG UK Representation in the coming weeks. Sulaimani, Kurdistan Region, Iraq (cabinet.gov.krd) – On the sidelines of the annual Sulaimani Forum, Kurdistan Region Prime Minister, Nechirvan Barzani, yesterday received Ambassador Ilya Morgunov, Russian Federation ambassador to Iraq and his accompanying delegation, which included the Russian Consul General to the Kurdistan Region and a number of Russian officials. The two sides discussed the latest developments in the war against terrorism in Kurdistan, Iraq and Syria and the possible repercussions of the war on the entire region. Prime Minister Barzani thanked the Russian Federation for the military aid provided very recently to the Kurdistan Region, and reiterated Kurdistan Region’s desire to develop its relations with the Russian Federation. He stressed that in order to eliminate the Islamic State terrorist organization, ISIS, the Kurdistan Region Peshmerga Forces continuously need the support of the international community. The two sides also discussed the relations between Kurdistan Region and the Federal Government of Iraq, highlighting the outstanding issues between Erbil and Baghdad. In this regard, Prime Minister Barzani reiterated that the Kurdistan Region has still the desire to settle all the problems and differences through dialogue and mutual understanding. Meantime, Prime Minister Barzani stressed that a new form of relations between Erbil and Baghdad should be found as all previous forms have failed. On his side, the Russian ambassador expressed his satisfaction with his meeting with Prime Minister Barzani, reiterating his country’s readiness to support the Kurdistan Region in the war against ISIS. The fourth annual Sulaimani Forum, held by the American University of Sulaimani, was opened today in the presence of Prime Minister, Nechirvan Barzani, Deputy Prime Minister, Qubad Talabani, a number of Kurdistan Regional Government and Iraqi Fedral Government ministers and members of Parliament, ambassadors and foreign missions representatives in Baghdad and Erbil, and a number of distinguished scholars, analysts and experts. In his speech, Prime Minister Barzani explained the current situation in Kurdistan Region, focusing on the internal political conditions, the war against ISIS, the economic crisis and Kurdistan Region’s relations with Baghdad. I, and on behalf of Mr. Qubad Talabani, welcome you all to the city of Sulaimani, the cultural capital of the Kurdistan Region. I welcome you to the Sulimani Forum that has been successfully held by the American University of Sulaimani, annually. I applaud my dear brother Mr. Barham Salih and administrators of the American University for organizing this important forum to discuss and analyze the situation in the Middle East at the time of ISIS. We are gathered here on one of our people’s tragic days and that is the 28th anniversary of the chemical gas attack on Halabja. On this day we pay tribute to the martyrs of Halabja and all the martyrs of Kurdistan. On this sad occasion and as honor to the blood of our martyrs it is very important that we resolve our internal disputes through dialogue as soon as we can. It is not important for us to win against each other, but it matters that we get together and win against ISIS and terrorism for we still have a long war ahead of us. It is unfortunate that the desire to break and impose one’s will on another brought the situation in the Kurdistan Region from a unique political integrity to an undesirable point as a result of which the people and institutions have suffered greatly. We did our best to prevent this situation from happening, but unfortunately between the bad and the worse the worse happened. We were in the midst of a terrible war. Kurdistan needed to preserve its domestic stability by all means, so that our country and the war front do not break. That is also exactly what our coalition partners told the people of Kurdistan. The President of the Kurdistan Region took all the necessary legal steps for the election of a new president on time, but the High Independent Election Commission announced that it was unable to hold an election. The Kurdistan Advisory Council also extended the president’s term as a necessity to the situation in Kurdistan. In addition, we offered a new proposal to amend the powers of the president of the Kurdistan Region in order to maintain the political unity at this delicate juncture. But unfortunately, the efforts to bring down a president who was at the front-line, the efforts to impose wills, parliament’s push to further complicate the situation instead of resolving them and turning the parliament into a center of manipulation at that sensitive moment, caused people to suffer for their own legitimate institutions. The entire process was run through provocation despite all the efforts encouraging patience and guidance form our coalition partners for an agreement and preservation of our political and domestic stability. Internal political issues come up in every country, but what is important is for the will for a resolution to be there. And it is now time for all parties in Kurdistan to show that will, and sit together to solve all the issues and correct the shortcomings and re-activate the parliament in a way that will regain the trust and peace of the people of Kurdistan. The negotiations between the Kurdistan Democratic Party and the Patriotic Union of Kurdistan are a glimmer of hope in this regard. We hope negotiations and talks resume in a serious manner between all parties with the aim of a solution for all the issues. What is also pleasing is that there is a political will that has started with great popular support for reform which is an essential help to the government and a healthy governance in Kurdistan. And we in the government have started taking important steps towards reform and transparency, and will continue that long-term process. We thank all the people of Kurdistan in general and every single civil servant in particular for their perseverance and patience. We know this is a severe crisis and has affected the livelihood of every household, therefore their patience is worthy of honor. The Kurdistan Regional Government is trying every avenue to overcome this crisis, and rest assured that this crisis will pass and people’s lives will improve again and reconstruction and progress will resume. God has granted the people of Kurdistan a fertile land, abundant natural resources and a strong will. For that we can surmount all crises. ISIS brought a war and heartbreaking tragedies to Kurdistan and the region, and the savagery and threat of that organization reached many parts of the world in a short period of time. The savagery was especially severe in Kurdistan with the massacre of the Yezidi Kurds and the abduction of our Kurdish Yezidi mothers and sisters, the destruction of Jalawla, Kobani and Sinjar. Among all of its savagery, the ISIS abduction of our Yezidi women and girls was the most horrific to us. Though we have so far been able to free two thousand four hundred twenty six of our women, girls and children, many more are still sadly held hostage by ISIS. Our friends and allies, chief among them the United States, have supported the people of Kurdistan especially with air strikes for which we are grateful. But the real threat has been faced off by the Peshmerga on the ground. With the Peshmerga blood and sacrifice this threat has been stopped from spreading further to the region and the world. As a national force the Peshmerga has distanced itself from political dispute throughout its war with ISIS. It has been a defender of humanity and played a key role in protecting all ethnic and religious groups in the region. The Peshmerga is the only force that has the trust of all people in the region and the world. And it is for the same reason that Arab, Christian, Turkmen, Bahai and Mandaean refugees seek shelter in areas under Peshmerga and KRG control. On the one hand it is a pride for the people of Kurdistan to be consistently defending the human values and on the other, it obliges the allied countries to try to professionalize the Peshmerga forces, and help it progress and grow stronger. This is more crucial at a time that an offensive on Mosul is in the making, and the Peshmerga is the force that the people of the region fully trust and believe in the success and stability of any operation the Peshmerga is part of. The world is now doing research on how to prevent the rise of groups like ISIS in Iraq and other places once ISIS has been defeated. But unfortunately, policies pursued and practiced in the surrounding areas of Kurdistan, the growing sectarian strife, show that the emergence of groups such as ISIS and even more savage is not unlikely. Therefore it is important that Peshmerga’s role in protecting regional and global security is valued. As a result of the events in Syria followed by the fight against ISIS, apart from the enormous war costs, the burden of 1.8 million refugees was thrown upon the Kurdistan Region. On top of that, the Iraqi government continued to withheld the budget of Kurdistan Region’s civil servants and Peshmerga forces, who are according to the Iraqi constitution part of Iraq’s own national forces. The coalition partners and international community did not do anything either to make Iraq commit to its obligations towards the Kurdistan Region, in particular the Peshmerga forces. In the meantime, the decline in oil prices, depriving the Kurdistan Region of Iraq’s cash reserves and international loans, made the economic crisis on the people of Kurdistan ever more harsh. It is similarly unfortunate that in this time of crisis no country has given the Kurdistan Region any financial support. At a time when Kurdistan has turned into the forefront of the war against terrorism and home to its refugees, the people of Kurdistan expected the world to help their country. But unfortunately that has not happened yet. But we stress once again to the whole world that the people and Peshmerga forces of Kurdistan need your support in this war and economic crisis. The people of Kurdistan and our friends testify to the fact that the Kurdistan Regional Government has in the last several years done all it could and traveled to Baghdad numerous times with initiatives and gestures of goodwill to solve the disputes with Baghdad, but unfortunately our efforts bore no result. We would have loved for Baghdad to solve its disputes with the Kurdistan Regional Government with deeds, but in reality the federal government is evading more and more its obligations as a state towards the Kurdistan Region. After we showed all willingness for a practical agreement with Baghdad to no avail, all parties and the people of Kurdistan have lost hope in the Iraqi government. And now, before all the respectable Iraqi officials and leaders present here today, we say it again that we want an agreement with Baghdad. We have to be realistic and know the reality of Iraq’s ethnic and religious make-up. And know as well Iraq’s geographical realty before we go ahead and decide on a new model of governance for Iraq. Previous formulas of coexistence all failed. But we are still ready to negotiate and agree on a new model of governance and administration that would please the whole region. The Kurdistan Region has become a victim of regional hostilities. The terror and violence facing Kurdistan today has from outside its borders, and it is the byproduct of the sectarian and international strife in the region. But with the commitment and sacrifice of its people this threat has been stopped at the gates of Kurdistan and the world. Now and likewise in the future Kurdistan is in an important position and can play a vital role in protecting the regional and global security. Therefore, any redesign of the region will not succeed without the participation of the Kurdish people and taking into account their interests. Because the Kurdistan Region is a central pillar for the region’s stability. In conclusion, I wish the Sulaimani Forum all success, and hope that the youth of the American University in Sulaimani have an effective participation in the discussions and dialogue with politicians and experts in all panels. Once again, I welcome you all and wish you an enjoyable time in Kurdistan’s spring season. Erbil, Kurdistan Region, Iraq (cabinet.gov.krd) – On the occasion of twenty-eighth anniversary of the chemical attack on Halabja, in Iraqi Kurdistan, the Director General of The Hague based Organisation of the Prohibition of Chemical Weapons, OPCW, Mr Ahmet Uzumcu, issued a statement, expressing his organisation’s sympathy with the people of Halabja. On 16 march 1988, Saddam Hussein forces bombed the Kurdish town of Halabja with chemical weapons, killing over 5000 civilians, men women and children and wounding thousands of others. 16 March 1988  marks the twenty- eighth anniversary of the brutal chemical weapons attack in the town of Halabja that claimed thousands of innocent lives. Those who survived remain forever scarred, in body and spirit. On behalf of the Organisation of the Prohibition of Chemical Weapons, I convey our deepest condolences and sympathies to the people of Halabja and assure them of our support. The memory of Halabja serves as painful reminder of human cost claimed by these dreadful weapons. It is our responsibility – to the victims and to the humanity in general – to ensure that no-one is ever again exposed to such untold suffering. A complete and effective ban on the production and use of chemical weapons is a fitting memorial to the victims who suffered at the hands of these abhorrent weapons. Let us recommit ourselves that we would not allow anyone, under any circumstances, to use chemical weapons. Duhok, Kurdistan Region, Iraq (cabinet.gov.krd) – In a ceremony held today in Duhok, attended by Kurdistan Region President, Masoud Barzani, Prime Minister Nechirvan Barzani, Chancellor of Kurdistan Region Security Council and Honorary President of the American University of Duhok, Masrour Barzani, a number of foreign diplomatic representatives and KRG and Iraqi ministers and political parties’ representatives, the American University of Duhok was opened. I warmly welcome you all to this important event. I am pleased to be here with you all to participate in the grand opening of the American University Duhok Kurdistan. This university will become an excellent center of education for the city of Duhok and Kurdistan Region and will be known as yet another accomplishment for the Duhok province. I would like to seize this opportunity to offer my sincere congratulations to Mr. Masror Barzani for being the driving force behind the establishment of the University as well as the people of Kurdistan in general and Duhok in particular. Quality of educational institutions in any country is an indicator of its level of development, advanced nations are known for their world-class education and academic excellence. Therefore; we have to attach great importance to building and enhancing the quality of our educational institutions. Opening a university during this challenging period is the right message to our enemies that no matter how hard they try, they will not be able to stop our path to prosperity and growth. It is also a sign that the love of our people for life, development, and building a brighter future cannot be eliminated by difficulties facing our region. Fighting for the freedom of Kurdistan prevented our fathers and grandfathers from graduating from universities. They sacrificed their lives so that the new generation can have the opportunity to study at universities. I salute our martyrs for giving us our freedom. The Kurdistan Regional Government has placed great importance on the education sector and higher education. We have given the opportunity to the private sector to open institutions and universities in the Kurdistan Region in accordance with international standards of academic excellence. The number of educational institutions in the Kurdistan Region has considerably increased in the past several years. Currently, we have 15 public universities, several public technical institutes, 13 private universities, and 9 private technical institutes. The Kurdistan Council of Medical Specialty and Kurdistan Board for Strategic Studies and Scientific Researches are also of equivalent status to universities. Today 94,700 students are enrolled in higher education institutions in the Kurdistan Region. Forty-eight percent of students are female, a very positive indicator that will increase women participation in the development of our society in the future. Kurdistan Region is now in great need of occupational education. Training individuals through occupational education programs can greatly contribute to the development of our Region. Therefore, we have to pay more attention to such kind of educational programs to enhance human resources and capacity building. We all know that the imposed war on Kurdistan Region and other challenges have placed a tremendous burden on the shoulders of our people. Since the beginning of 2014, the Iraqi government has cut the share of the Kurdistan Region of the federal budget. This was followed by the imposed war on Kurdistan Region by the most barbaric terrorist organization, which caused the displacement of 1.8 million refugees and internally displaced people to our region. Lastly, our economy has suffered the most painful blow due to sharp drop in oil prices. We understand the magnitude of challenges facing our region. We consider the challenges as a golden opportunity and an important lesson to remedy our shortcomings and to conduct meaningful economic reforms. In that regard, we have started to implement a comprehensive reform plan, particularly in the areas of administrative system and fiscal administration in order to balance the budget. We will implement necessary measures to further enhance revenue transparency, in particular oil revenue transparency so that we can put an end to the campaign against Kurdistan Region on oil revenues. To successfully pass this stage we are in need of full cooperation between the people and the government of Kurdistan Region. On behalf of myself and the government of Kurdistan Region, I express my sincere appreciation to the people of Kurdistan Region, especially those who live off government salaries for their resilience. I want to reassure all public servants that their financial entitlements will not be wasted. We were obliged to take some temporary austerity measures as part of our plan to overcome the financial crisis. We have overcome even harsher situations in the past. I firmly believe we will successfully pass this stage as well. Throughout the history, we have experienced immense hardships; yet we have never surrendered. We believe in the will of our people, and we believe a brighter future awaits us. Please allow me to offer my sincerest appreciation for the bravery of our Peshmergas who sacrifice their lives to defend Kurdistan. Their bravery is recognized by the whole world. I salute the martyrs who lost their lives defending the freedom of Kurdistan and values of humanity in the fight against the terrorists. I would like to once again extend my appreciation to the people of Badinan and particularly the city of Duhok for their remarkable humanitarian response and warm welcome to the displaced Yezidis, Christians, and Muslims who took refuge in the Duhok province fleeing the cruelty of ISIS terrorists. The people of Duhok can hold their heads up high because they taught the whole world a lesson in humanity. The people of Duhok very generously opened the doors of their homes, mosques, and schools for the refugees and displaced people, regardless of their ethnic or religious background. Our welcoming attitude perfectly demonstrates our culture of peaceful co-existence and religious tolerance that is deeply rooted in our society and history. Peaceful co-existence of different religious and ethnic groups in the Kurdistan Region is widely acclaimed internationally and has become a source of our pride. I would like to thank the governorate of Duhok, the Governor, and all local authorities for bearing such an immense responsibility and for working hard to provide services for the people of Duhok and for more than 670,000 displaced people and refugees in the province. I also like to thank all local and international organization for helping us to relief the suffering of the refugees and displaced people in the region. The genocide committed against our Yezidi sisters and brothers will never be forgotten. It was one of the most heinous crimes against humanity in the recent history. The massacre of Yezidis, kidnaping their women and girls, destruction of their villages and hometowns, and the atrocities committed against our Christian brothers in the Nineveh plain and other components of our society can never be forgotten, the wounds are too deep to be healed easily. There is no doubt that ISIS terrorists will pay a heavy price for their atrocities. We will continue to do whatever it takes to support our Yezidi brothers and sisters and to give them the hope of a better future. The liberation of Shingal under the direct command of President Barzani was the first step in our efforts. Our next step is to rebuild Shingal and to provide a better life for its people. Please allow me to reiterate our call upon our friends in the international community to help us rebuild areas destroyed by ISIS terrorists so that the displaced people will have the opportunity to start a new life in their hometowns. We believe the biggest blow to ISIS would be to help the displaced people return to their hometowns and build their lives stronger than ever before. The peaceful co-existence of the people of Kurdistan Region has to be protected and practiced in other areas. We are relentlessly continuing our efforts to free our Yezidi sisters and brothers from ISIS terrorists. So far we have been able to rescue 2,426. Just today we have rescued 5 women and 14 children and we will not relent in our determination to rescue those still in ISIS captivity. We have also made progress in our efforts to obtain international recognition for the crimes committed against Yezidi Kurds as acts of genocide. We are grateful for the support provided to the Kurdistan Region in the fight against ISIS by the U.S-led Coalition in terms of air strikes, military training and support. With the support of the coalition, our Peshmerga forces have been able to inflict heavy damages on ISIS and to consolidate the frontlines. As for the internal unity of the Kurdistan Region, I would like to reiterate our commitment to solve internal disagreements through dialogue and negotiation. Our internal unity is of paramount importance, when we are united, together we can build a brighter future for the people of Kurdistan Region. At the end, I would like to once again congratulate the opening of this university. I am confident this university will contribute to the development of higher education in the Kurdistan Region and will become a place where students can receive excellent education, helping them to build a bright future for themselves. This university will be another bridge of communication between Kurdistan and international universities. I thank the company that built the campus of the university, and I wish them continued success. Erbil, Kurdistan Region (dfr.gov.krd) – Minister Falah Mustafa today met with Russian Ambassador to Iraq Mr. Ilya Morgunov and Russian Consul General in Kurdistan Mr. Viktor Simakov to discuss strengthening bilateral ties and challenges facing Kurdistan and the wider region. Minister Mustafa and Ambassador Morgunov reviewed ways of strengthening bilateral cooperation between the Russian Federation and the Kurdistan Region in various fields. Minister Mustafa briefed the Ambassador on the ongoing security, financial, and humanitarian challenges facing the KRG and requested continued support from the Russian Federation. Ambassador Morgunov affirmed the commitment of his government to continue to provide military and humanitarian assistance to the Kurdistan Region. He stressed that the international community has a shared responsibility to support the region in the fight against ISIS, as it poses a serious threat to international security and peace. Erbil, Kurdistan Region (dfr.gov.krd) – DFR hosted a special session today for the KRG Minister of Interior and Mayor of Shingal to brief diplomats and representatives of UN agencies and INGOs based in Erbil on the needs of the city. At the outset of the meeting, Minister Falah Mustafa, Head of KRG Foreign Relations called for a moment of silence to show respect for the victims of the atrocities committed against the Yezidi Kurds by the ISIS terrorists. Minister Falah Mustafa, Head of KRG Foreign Relations, thanked diplomats and representatives of UN agencies and INGOs for attending the meeting. Minister Mustafa thanked the US-led Coalition for the support provided to Peshmerga forces in the liberation of Shingal. He stated that “Liberation of Shingal was very important to the people of Kurdistan and the civilized world. The ISIS terrorists have committed grave crimes in Syria and Iraq but the most barbaric and heinous crimes were committed in Shingal. ISIS committed another Anfal against Kurds in Shingal.” The Minister called for urgent support from the members of international community in the reconstruction process of the city of Shingal, as eighty percent of the city has been completely destroyed. KRG Minister of Interior and Acting Minister of Peshmerga, Mr. KArim Sinjari highlighted the role of Peshmerga forces and the contributions of the Counter-ISIS Coalition in the fight against ISIS. Minister Sinjari requeted the international community to allocate specific financial assistance to the KRG from the funds offered to the government of Iraq, to help KRG document the crimes committed against Yezidis, and to support KRG’s efforts to gain international recognition of the Yezidi genocide. Calling for an international conference on the reconstruction of Shingal, Mayor of Shingal, Mahma Khalil, gave a brief overview of the history of Shingal, the crimes committed against the Yezidi Kurds and the needs of the local administration to restore life in the city. Mayor Khalil also called for international support to free the Yezidi women from ISIS and to provide rehabilitation programs to those who have been rescued. He said that still 3,878 Yezidi women remain in ISIS captivity. The Mayor asked for the support of the UN to restore trust among the various communities in Shingal area and reiterated the commitment of his administration to peaceful co-existence and religious tolerance. Director General of JCC, Mr. Hoshang Mohammed, presented the findings of a comprehensive assessment of the immediate needs and urgent priorities for early recovery, which captured the level of the damage sustained to infrastructure inside the city as well as public and private property. Mr. Alain Guépratte, Consul General of the French Republic and acting dean of the diplomatic community, and several other diplomats expressed deep sympathy to the families of the victims of Shingal tragedy and commended the Peshmerga forces on the liberation of Shingal. They voiced their support for the stabilization and reconstruction process of Shingal. The meeting was attended by diplomats from Republic of France, United Arab Emirates, Republic of Turkey, Kingdom of Netherlands, Islamic Republic of Iran, Russian Federation, Republic of Hungry, People Republic of China, Czech Republic, Hashemite Kingdome of Jordan, Republic of Poland, Arab Republic of Egypt, Italy, United States of America, Sweden, Republic of Korea, State of Kuwait, Republic of Sudan, Kingdom of Saudi Arabia, United Kingdom, Republic of Romania, State of Palestine, Japan, India, Bulgaria, EU and representatives of ICRC and UN agencies based in Kurdistan. Erbil, Kurdistan Region (dfr.gov.krd) – On the initiative of Mr. Jẚn Kubiš, Special Representative of the United Nations Secretary-General for Iraq, a delegation of Ambassadors of G7 countries, Iraq’s World Bank Representative and the Head of EU Delegation in Iraq visited the Kurdistan Region to discuss the economic and fiscal challenges facing the Kurdistan Region. “I am very glad to have visited the Kurdistan Region today together with the Ambassadors of G7 countries, Iraq’s World Bank Representative and Head of EU Delegation in Iraq. We had productive meetings with President Masoud Barzani and Prime Minsiter Nechirvan Barzani. Considering the current economic challenges and fiscal crisis, we focused on the ways that the international community can help the Kurdistan Regional Government, notably promoting and implementing the reform plan, which have already been announced by the government.